Research can be tedious and boring, but not with InstaGrok. It has innovative features that can help you master information research skills in a fun and effective way. With other search engines, you open over 10 tabs and you completely lose track of your thought process. But InstaGrok is a great alternative to other online search tools because it really focuses your search and shows your train of thought. 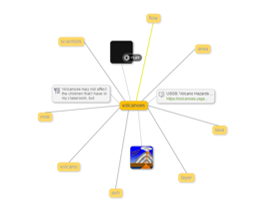 When you are studying and need more information about a topic, you simply go to InstaGrok.com, type in your keyword, and an illustrative concept map will appear. A concept map is used to visualize relationships between concepts. You start off with your keyword and from there it branches off and graphs nodes corresponding with the previous topic. You can click on any of these nodes and another pop-up will appear giving you more information on it. Not only does InstaGrok create these concept maps, but you can also create your own, helping you study or better understand things. Another feature this app offers is once you search your keyword and the concept map appears, there are two other tabs you can click on; Journal and Quizzes. Under the Journal tab, you can take notes to save with the concept map, or just to jot down a few ideas. But if you still want a better understanding of your topic, then click on the Quizzes tab. InstaGrok generates quizzes in accordance with whatever your keyword is, greatly helping with transfer and application of knowledge. This entry was posted in Tech Blog and tagged Assistive Technology, Computer, CSD Tech, Organization, Research, Studying, Website.